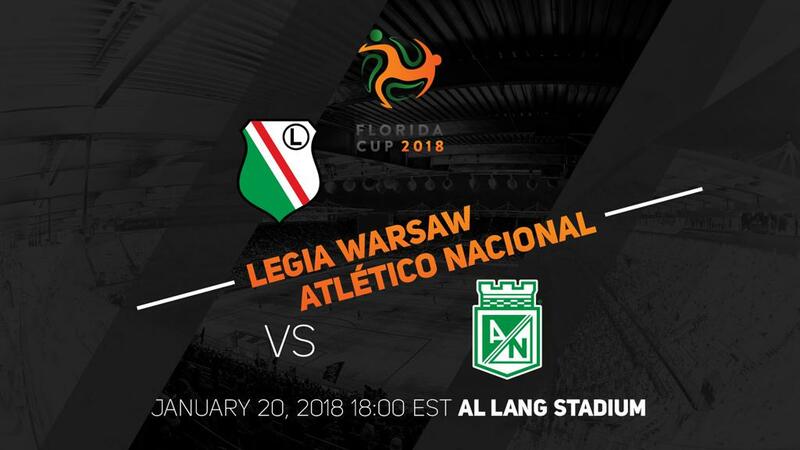 ST. PETERSBURG, Fla. (January 3, 2017) -- 2016 Copa Libertadores champion, Club Atlético Nacional of Medellin, Colombia will take on Poland’s legendary Legia Warsaw in an international showdown at Al Lang Stadium on Saturday, January 20 at 6 p.m. Don’t miss this historic match pitting two world class teams against one another in the Sunshine City. The match is the final game of the Florida Cup, the largest international soccer celebration held annually in Florida. Globally recognized soccer clubs from Europe and Latin America convene in Central Florida for this Illustrious tournament. It is a global platform that combines sports and entertainment. Broadcast live to over 140 countries, this tournament reached over 50 million viewers in 2017. Club Atlético Nacional is Colombia's most popular and successful club. The club has won 16 league titles, three Copa Colombias, two Superliga Colombianas, and a total of 21 domestic titles. Los Nacionalistas were also the first Colombian club to win the Copa Libertadores in 1989 and, after winning the title again in 2016, is the only Colombian team to win that prestigious tournament more than once. It has the most international titles of any Colombian club, having also won the Copa Merconorte twice, the Copa Interamericana twice, and the Recopa Sudamericana once, for a total of seven international trophies and grand total of 28 titles across all competitions. Legia is one of the most successful Polish football clubs in history, winning twelve Ekstraklasa Champions titles, a record 18 Polish Cup trophies and four Polish SuperCup matches. Legia was founded in 1916 and holds first place in the Polish First Division all-time table. Don’t miss this historic international match! Great tickets start at only $27.20 and are available at floridacup.com/tickets. For more information on the Florida Cup, visit www.floridacup.com.